REDDING, Calif. – For Lisa Kassik of Corning, earning her college degree was a lifelong goal two decades in the making. The 47-year-old mother of three first began college courses nearly 23 years ago, and even though she has gone through difficult times, she holds firm to her motto: everything we go through can better prepare us to help others. Kassik was among 184 graduates at Simpson’s winter commencement on Saturday, Jan. 21, including nearly 120 from the ASPIRE program. Kassik always considered herself to be a good student. Studies came easy to her, and friends and family always thought she would go to college. After high school she enlisted in the military until she became pregnant with her son. 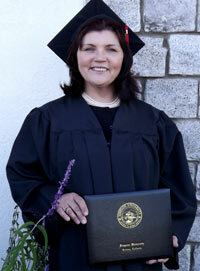 After the birth of her son she began taking college courses and graduated with her A.A. degree. But years later, Kassik’s life began to spiral out of control due to substance abuse. At her lowest point, she said she was homeless and living under a bridge and her mother took custody of her son. Her struggle with substance abuse continued for several years until she found help at the House of Mercy, a women’s rehab center in Oroville. After she worked as a waitress and cleaned hotels, Kassik’s husband, Lee, encouraged her to apply for a job at Sierra Pacific, where he had been working. She was offered a full-time position in the window division of the company. With her life back on track and her three kids out of high school, Kassik knew that it was the right time to finish her degree. But just before enrolling in college, Kassik’s dad lost a long battle with cancer. Kassik enrolled in Simpson’s ASPIRE program in fall 2010. After looking at other universities, she found Simpson’s program to be the best fit for her to earn her B.A. in psychology. After graduating, Kassik will continue working at Sierra Pacific, where she has been for 13 years, and continue volunteering at PATH, the Tehama County homeless shelter. She plans to look into becoming a social worker or community advocate.